Tomasz Daroch is going to perform at Warsaw Philharmonic on January 23 & 24, 2015. He plays the Antonin Dvorak Cello Concerto with Warsaw Philharmonic Orchestra, conducted by Jonathan Darlington. 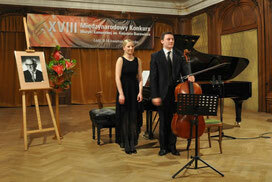 2nd Prize at the 48th International Pablo Casals Cello Competition 2014 in Budapest at the Hungarian Academy of Music. We are pleased to share the information about the latest success of Daroch Duo. Tomasz Daroch and his sister Maria have won the 18th Bacewicz's International Chamber Music Competition in Lodz in Poland. Tomasz Daroch and the Artur Rubinstein Lodz Philharmonic celebrated the composer´s 100th birthday with an anniversary concert on Friday 25 January, marking the official launch of the Witold Lutoslawski Year in Poland. 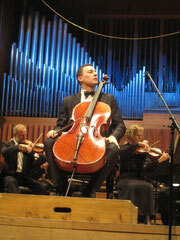 Tomasz with Lodz Philharmonic, conducted by Joshua Dos Santos, performed Witold Lutoslawski Cello Concerto. Tomasz Daroch among the Prize winners of the International Sommerakademie der Universität Mozarteum 2012 in Salzburg. He is going to perform tonight accompanied by his sister pianist Maria Daroch during the Prize winners concert at the Große Universitäts-Aula in Salzburg. From the 22nd to the 31st of May St. Petersburg will host ‘the parade of the winners” – the world-famous international Musical Olympus Festival. This year the program of the festival includes seven concerts of young outstanding musicians in the best halls of the city, as well as a special social concert program. At the XVII Musical Olympus Festival more than 30 participants from 13 countries will represent Russia, Azerbaijan, Belarus, Moldova, Germany, Poland, Spain, Switzerland, Greece, Mexico, Korea, Singapore and Japan. The young musicians will perform together with such famous St. Petersburg orchestras as the Mariinsky Theatre Symphonic Orchestra, the St. Petersburg State Academic Capella Symphonic Orchestra, the St. Petersburg Philharmonic Academic Symphonic Orchestra and the State Hermitage Orchestra. Tomasz Daroch is going to perform on April 20, 2012 in Torun/Poland. He plays the P. Tchaikovsky Variations on a rococo theme with Torun Symphony Orchestra, conducted by Oleg Zverev. We are very happy to inform that Tomasz Daroch has just reached the Finals at the 5th International Antonio Janigro Cello Competition in Zagreb. 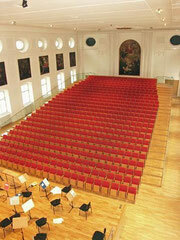 Tomasz Daroch is going to perform the Haydn Cello Concerto No. 2 in D Major, Hob. VIIb/2 with the "Moscow Virtuosi" Chamber Orchestra conducted by Vladimir Spivakov during the gala concert (2011 Nov.24th) of the 3rd Rising Stars at the Kremlin in Moscow international festival of young classical musicians. The Rising Stars At the Kremlin festival is held on the initiative and under the patronage of Russia’s First Lady. Russia’s First Lady, Svetlana Medvedev, is sure that the International Festival “Rising Stars in the Kremlin” involving young classic music performers will always unite those whose talents and creative ideas are called on to expand the cultural heritage of their respective countries.